Six dogs died in the 2009 Iditarod. 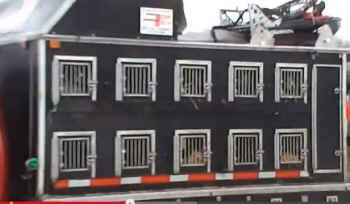 It is believed that two of the dogs froze to death. Musher Lou Packer admitted that he could feel ice form under the skin of one of the two dogs before he died. Three other dogs dropped dead on the trail and the cause of their deaths is “inconclusive.” The sixth dog died of unknown causes during a flight out of the area after her team was scratched from the race. 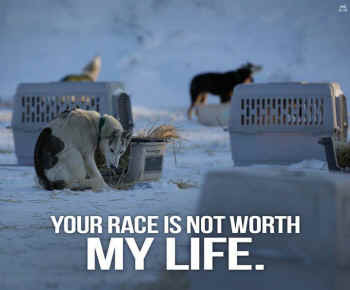 The Iditarod is a cruel event that causes dogs to suffer and die. Dogs in the Iditarod pull heavy sleds through some of the worst weather conditions on the planet, including 60 to 80 mph winds, whiteouts, and temperatures as low as -50°F. Their feet are torn apart by ice and distance. Many dogs pull muscles, incur stress fractures, or become sick with diarrhea, dehydration, intestinal viruses, or bleeding stomach ulcers. In January 2005, the Journal of Veterinary Internal Medicine published an assessment showing that 61 percent of the sled dogs studied exhibited an increased frequency of gastric erosions or ulcers after completing the Iditarod; none of the dogs studied had exhibited these symptoms before the race. Another study published in the American Journal of Respiratory and Critical Care Medicine in 2002 found that 81 percent of the dogs run in the Iditarod had “abnormal accumulations” of mucus or cellular debris in their lower airways. According to the report, this accumulation was classified as moderate to severe in nearly half of the dogs. At least 136 dogs have suffered and died on the Iditarod trail since records of the race started being kept. Three dogs perished in the 2008 race: one who died after inhaling his own vomit, another who was killed after being hit by a snowmachine (another dog was seriously injured in the same incident), and a third who died of unknown causes. 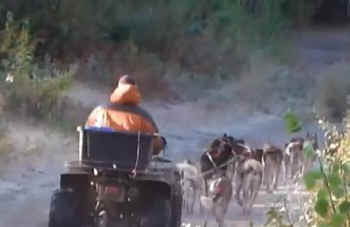 At least five mushers quit the race because their dogs were ill and suffering. 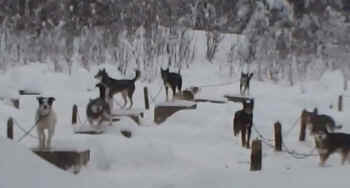 In addition, two dogs were abandoned by their musher when they left the team and she was unable to locate them. 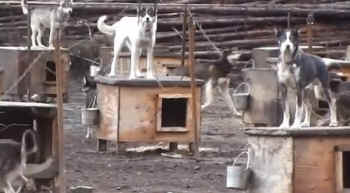 Iditarod organizers downplay the dogs’ suffering and work to hide the abuses from the public. Even when mushers are caught beating dogs, as musher Ramy Brooks was in 2007, he barely received a slap on the wrist. Even though one of his dogs later died, rather than banning him for life, the Iditarod committee will allow Brooks to race again. Today’s event lacks the purpose of the original Iditarod, which was a race along a mail route to deliver an emergency supply of diphtheria serum to Nome. Now the participants—almost none of whom are indigenous Alaskans—are motivated solely by the cash prize, and they will do almost anything to get it. In addition to being subjected to the obvious cruelty of the race itself, dogs used in the Iditarod also pay a terrible price behind the scenes. Not every puppy born is a fast runner, and those who do not make the grade are usually killed—sometimes by bludgeoning—for not possessing monumental stamina and speed. 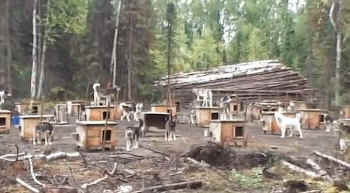 Mushers freely admit that dogs who do not measure up are killed, and one musher equates it to “weeding a garden.” Almost invariably, those dogs who survive the cull spend their lives in cramped, substandard kennels that are rarely—or never—inspected by any regulatory agency. Many kennel operators keep dogs tethered on short ropes or chains.